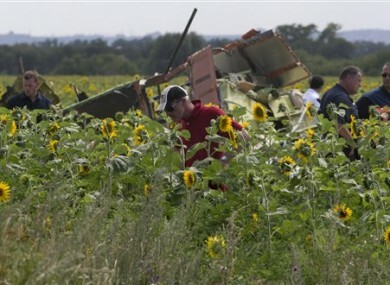 Dutch and Australian investigators examine pieces of the crashed Malaysia Airlines Flight 17 in the village of Rassipne, Donetsk region, eastern Ukraine today. A SMALL GROUP of Dutch and Australian investigators are at the unsecured site where Malaysian Airlines Flight 17 went down today. The group took notes and photos as their governments prepared police detachments they hope can help protect the crash area and bring the last of the victims home. The Dutch government said 40 unarmed military police were leaving the Netherlands late today for eastern Ukraine to help investigators, while Australian Prime Minister Tony Abbott has said his government is close to a deal to send police. Australia has 90 federal police officers standing by in Europe. The Boeing 777 went down July 17 as it headed to Kuala Lumpur from Amsterdam, killing all 298 people on board. US and Ukrainian officials say it was shot down, likely by mistake, by a missile fired from rebel-held territory in eastern Ukraine, where pro-Russian separatists are fighting Ukrainian government forces. Of the dead, 194 were Dutch citizens and 37 were Australian citizens or residents. Both countries’ governments have expressed a determination to see the dead brought home and the accident investigated. Security concerns and rebel interference have delayed recovery of the bodies and limited investigators’ access to the site, more than a week after the crash. “This will be a police-led humanitarian mission,” Australian Foreign Minister Julie Bishop said in Kharkiv, where more remains were placed on flights to the Netherlands today for identification and investigation. Bishop spoke to the crews of the two airplanes, an Australian C-17 and a Dutch C-130, which flew another 74 coffins from Kharkiv in government-controlled eastern Ukraine to Eindhoven in the Netherlands. On arrival, the coffins were carried from the planes to a fleet of waiting hearses that took them to the central city of Hilversum, where an international team of forensic experts is working to identify the remains. No plan for a large-scale deployment of experts and security personnel had yet been announced today and the site remained largely unsecured. Four Australian and three Dutch investigators walked among the widely-scattered plane parts past two grazing cows near the village of Hrabove on a warm summer day. The investigators were accompanied by observers from the Organization for Security and Cooperation in Europe. The Dutch Safety Board leading the international investigation said it expects to publish “initial factual findings” as early as the end of next week, and that these will likely provide a picture of how the investigation will proceed. Email “Dutch government sending military police to protect MH17 crash site ”. Feedback on “Dutch government sending military police to protect MH17 crash site ”.